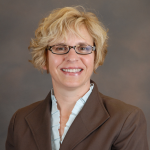 Karen Farris is the Charles R. Walgreen III Professor of Pharmacy Administration and Professor of Social and Administrative Sciences at the University of Michigan College of Pharmacy. She is chair (interim) of the Department of Clinical, Social & Administrative Pharmacy in the College. Her research and teaching focuses on social theories to examine how older adults manage their medications and the roles of pharmacists in influencing medication use, including public health issues. In terms of medication management, she studies medication adherence, reasons for non-adherence including concern and necessity beliefs and self-reporting adverse effects. She is leading a study to develop and quantify the impact of an artificial-intelligence based text-messaging system to improve medication adherence among individuals with uncontrolled hypertension. As well, she is working on two projects focused on understanding and affecting medication adherence to oral oncolytics. Her studies have used survey research, prospective cohort designs as well as controlled trials. Regarding pharmacists’ care, she quantified the impact of pharmacists’ care on medication adherence and, most recently, is examining the impact of pharmacists’ practicing under collaborative practice agreements in patient-centered medical homes. Dr. Farris is an active member of PQA (pharmacy quality alliance) and served on the NQF (National Quality Forum) Care Coordination Steering Committee for the Care Coordination Project. She was named Outstanding Graduate Student Mentor Award in Biological and Life Sciences at the University of Iowa in 2007, and Fellow of the American Pharmacists Association in 2006. In terms of scholarly activity, she has over 100 peer-reviewed publications and 150 peer-reviewed poster/podium presentations. She has given numerous invited talks at local, state, national and international venues and obtained over $7 million in PI/co-PI grants and $over 8 million as co-investigator on other grants involving pharmacists and their impact on health and health outcomes.